A deck makes the perfect addition to any home. Decks let homeowners sit outside in comfort while still having easy access to their house. Any homeowner can give parties on their deck for friends and relatives or just sit there at the end of the day and watch the sun go down. The homeowner who does not yet have a deck will find it much easier than they had imagined to have a deck added to their home. Many home builders can build one quickly that will look great and fit in well with the rest of the style of the house. 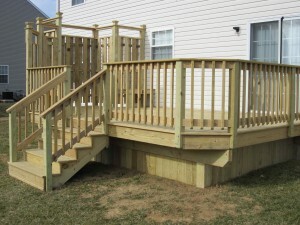 Someone who needs to have a deck builder in Kennett Square, PA can consult with the craftsmen at First State Contractors to figure out which kind of deck may be ideal for their needs and aims. Professionals here have been involved in the design and creation of many deck projects in this region. Their many years of experience in this field make it easy for them to provide their clients with a deck that is functional, elegant and fits well into any budget. Many area customers have been pleased with their visionary help. Contact us today or call us at 866-398-9103 for a free quote on your new deck.